Ask and You Shall Achieve! Great leaders don’t have great answers, they have great questions. But, the most important question you can ask is one that you ask of yourself. And it’s a question that very few people ever consciously think to ask. How do I get control of this situation? But is there something even more fundamental that we’re wanting to ask? Is there a “central question” that underlies almost all other questions? As one of the leading pioneers in the field of applied neuro-axiology, I’m convinced that there is. Science has shown that human beings are hard-wired to be value-judging, value-creating machines. When it comes down to it, our DNA is ingrained with the desire to figure out how to maintain and/or create value. In fact, success itself, is a function of creating value; the greater value you create the greater success you can achieve. “Value” (and true success) is about much more than just money or power or status, although these certainly are of great concern to many people. Value is also about love and caring. Value is about trust, a sense of belonging, and feeling good about ourselves. Value is about contribution, empowerment, and creativity. Value is what we want; what we see as being good and worthy of our time, energy, and resources. Value exists in every dimension of life; from the exhilaration of sports, to the intimacy of a loving relationship. Unleashing people’s potential to generate value, in all measures, is the essence of great leadership. Studies have shown that when organizational culture is based on the natural principles by which value (in all its dimensions) is created, productivity and cooperation will be 40% higher than organizations that do not have such a culture. While the context in which we might ask ourselves this question will change from moment to moment, there is no part of life, love or leadership in which being able to answer this question well is not fundamental to our success. How can you put The Central Question to work for you right now? It’s simple, just start asking it! Seriously ask yourself the question periodically throughout the day to keep it top-of-mind. Ask it before every phone call and meeting. Ask it whenever you have a decision or choice to make; whenever you feel stressed, confused, threatened, upset, anxious, uncertain, or fearful; whenever you find yourself procrastinating, or defending and justifying your position. Ask the question of others to elicit their best thinking and to unleash the innate human desire and potential to create value. In fact, ask it of yourself right now. 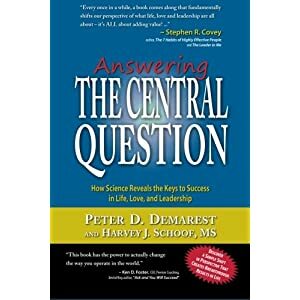 In the book, “Answering The Central Question,” it shows how people can be far more deliberate and intentional in developing a higher level of mastery. The science of neuro-axiology is revealing important information about the mind-brain and how one can change results by changing their thinking. For example, stop with the self-deceptive, positive thinking affirmations as a way to compensate for negative thinking. While it might get you over a hump, you’re just setting yourself up to have more humps to get over. When people consciously make The Central Question, the central question of their life, they naturally become better leaders, better workers, better parents, and better team members. They do this without having to fix their “weaknesses.” Simultaneously, they find a greater sense of meaning, purpose, clarity, confidence and peace of mind. This mindset reduces conflict, stress, confusion, procrastination, power-struggles, and overwhelm. In short, people achieve more of what they want, and create less of what they don’t want. Whatever business you’re in, whatever leadership position you have, even if it’s just you, learning to answer The Central Question may well be the key to achieving your next level of success. So how are you doing at taking that deep dive into “self” and exploring the central question? How are you thinking about your very own thinking? Are you interested enough in acheiving better results to challenge yourself to take that dive? How might a cleaner mindset improve your leadership? I would love to hear your thoughts! ← Have You Capped Your Potential?